Your home is your sanctuary, but sometimes your privacy is invaded. In 2016, Canada had nearly 160,000 accounts of breaking and entering, with the highest amount occurring in BC. Although most home insurance policies will cover physical damage to your home in the event of burglary, unless otherwise specified, your personal items will not be covered. With break and enter offenses on the rise, you risk losing your most memorable items and family heirlooms. For most cases, these incidents are easily avoided if some simple measures are taken. This seems fairly straightforward, but surprisingly, many Canadians still fail to lock their doors and windows. Don’t be under the false pretense that your neighbourhood is safe, as in most cases safe neighbourhoods are exactly those that are targeted since perpetrators suspect there are more valuable items and less security measures being taken. To prevent theft, lock your front, back, and side doors every time you leave or enter your home. By consistently doing so, you will make locking doors a habit. Sliding doors are an easy culprit for many burglars as the locks are not nearly as strong as those found in regular doors. Increase your sliding door security by inserting a bar into the track of the door. Although breaking glass is still an option, this is less likely as it will draw more attention with the noise. Having fancy lights to decorate the exterior of homes is not always just for looks. Exterior lighting deters burglars as they are now much more visible; therefore, lighting placed near entrances acts as an excellent defense mechanism. If you do not want your whole yard on display every time the sun goes down, consider installing a motion sensor light. These lights scare away intruders in mid attempt and are more energy efficient since they only turn on when motion is detected. If you are going to be away for an extended period, setting your interior and exterior lighting to turn on at different times is an effective way of making it seem like the home is occupied. Timers are fairly cost-effective and provide a lasting solution once installed by an electrician. This is less obvious, especially if you have great views from your home. Closing your curtains and blinds disguises the interior of your home and prevents burglars from scoping out what’s inside. Now, people from the outside will not be able to see your brand-new TV or laptop and don’t have the opportunity to view the layout of your home. With the curtains drawn, burglars also won’t know if someone is present in the house. Other people, such as snoopy neighbors, will be deterred from checking out your home while you’re at work. Close your curtains when you leave your home for work during the day, or when you go for a trip and are gone for an extended period of time. The next time you go to catch some sun or hit the slopes for a vacation, take some simple measures to make it seem like you are still at home. First, get rid of any boxes in your recycling that show you have just gotten some expensive, new items. This is especially relevant around the holiday season as searching through someone’s trash and recycling gives thieves an easy way to know if people have recently acquired some expensive goodies. When gone on vacation, let delivery services know in advance that you will be away so that newspapers and packages won’t pile up in front of the door. Ask a neighbour to pop in every once and a while to show there is motion in your home and arrange for someone to cut your grass or shovel your snow. SecuriWORLD provides a variety of security services in the Vancouver area, including event security, loss prevention, and bodyguards. 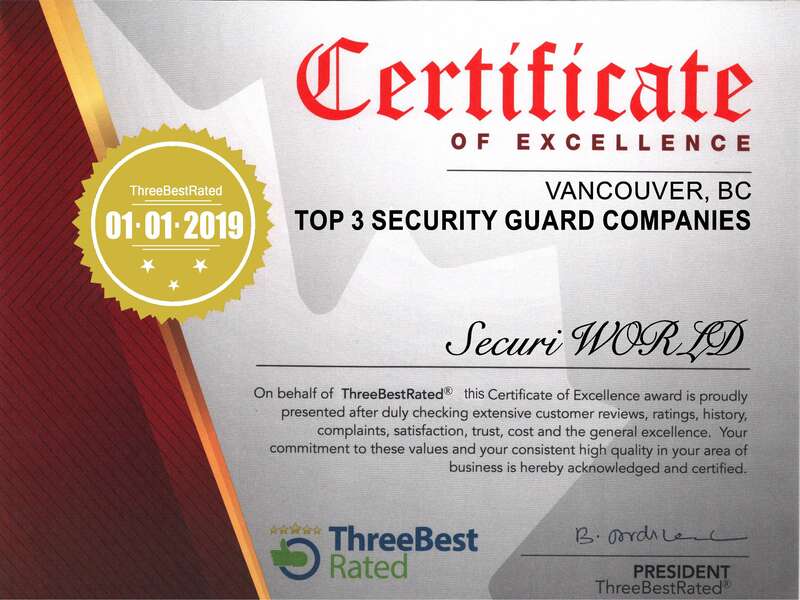 To discover more about Canada’s top managed security firm. call 1-888-613-1500 and request a free quote today.